Last week, we ran the etymological race. We saw the word was connected to error, which goes back to the Latin verb “to wander,” among other meanings. This made me wonder, an errand involves some kind of wandering about, does it not? And for that matter, something racy, something “risqué” and “spirited,” surely suggests the action and speed of running, no? Etymologies are a curious and illogical business. 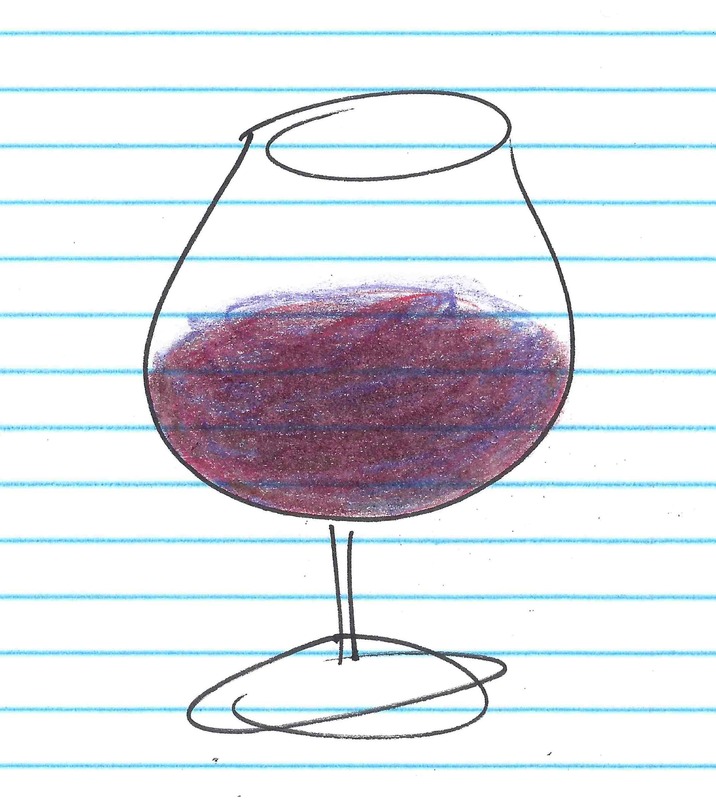 “Wine run.” Doodle by me. A boss sends out an errand boy for soy lattes. A couple braves parking lots for Sunday errands. As far as the written record is concerned, this sense of the word begins emerging in the middle of the 17th century. Originally, however, errand enjoyed a bit more status. The Oxford English Dictionary (OED) attests the word all the way back in the 9th century, where it signified a “message repeated to a third party,” especially a petition or a prayer. In Old English, errand took the form ǽrende, which has cousins across the Germanic languages. Now, fetching the ultimate origin of the word may be a fool’s errand–or, as an older expression goes, a sleeveless one. Some etymologists have connected ǽrende to another Old English word ár, “messenger,” but the connection is troublesome. A racy comment, a racy ad, a racy photograph, a racy…wine? As the OED attests, racy originally referred to wine back in the mid-1600s, as it described, in reference to the grapes’ soil, “having a distinctively strong taste or odour; piquant, pungent, or flavorful.” By the end of the 17th century, racy was also tasting of more general meanings of characteristically “spirited” and “invigorating.” By 1901, racy‘s liveliness was specifying something more “daring,” “suggestive,” and “slightly indecent,” as the OED offers. Racy joins race and the suffix –y. Different grapes have different skin colors, if you will, just like different races do. (Oh, if it were only with wine where color mattered.) This race, a “breed of grape” with a characteristic flavor of its soil, is a specialized sense of that race. The OED takes race back to the middle 1500s, when it denoted a “group of people, animals, or plants, connected by common descent or origin.” The ethnic sense, especially in reference to the distinctive physical features, was just as problematic a term when it appeared in the mid to late 1700s. As errand and racy show, sometimes the joy of etymology isn’t in crossing the finish line. When I see errand I think of errant, which could be said to mean, more or less, going the wrong way. This would link it to running or going somewhere, as one would on an errand. But probably this is just one of those false backward connections that arises when words have a similar sound, since I assume errant actually comes from error, to err, etc. I wonder if similar sounding words sometimes take on a general new connotation over time just because they sound similar to other words and so cause people to relate them in their minds, though they actually have nothing to do with each other linguistically. Interestingly, “rassig” in German usually means spirited or invigorating, sometimes classy, which would appear to hark back to the 17th century English connotations. It isn’t used to imply something is daring or indecent. “Ein rassiges Weib” is a phrase I’ve often heard used to refer to a classy, spirited woman. The word seems to have just as little to do with it’s parent word (“Rasse” = race, as in breed) as its equivalent in English. Indeed. With “errand,” I always assumed it was from the gerund form of the Latin “errare”: “errandus.” Appearances and associations can be very deceptive in etymology, particularly given English orthography. But yes, I would indeed say associations do influence the meaning of a word, as is shown in the very word “errant.” “Errant” most likely is from the Latin “iter,” but connections and similarities in Old French to “errare” certainly colored the word in form and function. Hi my friend! I want to say that this post is awesome, great written and include approximately all significant infos.